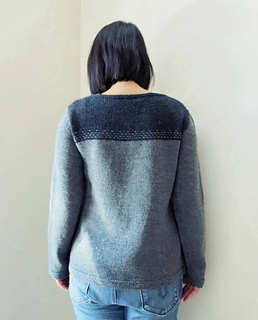 sizes are based on chest measurements of finished sweater in inches. Sample shown with 3” / 7.5 cm positive ease. 1 to 4” / 2.5 to 10 cm positive ease is recommended. Sport weight yarn, sample used Quince & Co. Chickadee. 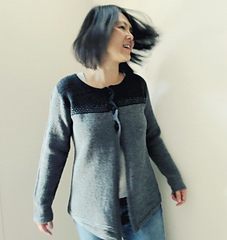 Yarn A, Sabine (Dark Gray) – 165 (175, 200, 205, 215, 230, 265, 275) yards / 150 (160, 185, 190, 195, 210, 245, 250) meters. 1180, 1275, 1390, 1490, 1640) meters. US #4 / 3.5mm in 32” / 80 cm length, or change size to obtain correct gauge. Same size needle for knitter’s preferred method of working small rounds for sleeves. 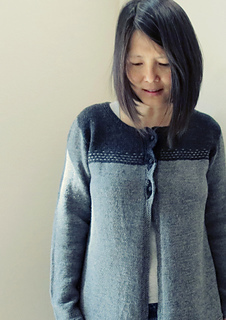 One size smaller needle for working neck band. Gauge 22 sts x 30 rows = 4” x 4” / 10 cm x 10 cm in Stockinette Stitch with larger needles after blocking. Notions ½” / 1.5 cm buttons x 3, stitch markers, tapestry needle for weaving in ends. 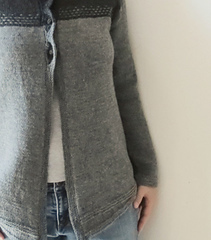 Two- color cardigan with set-in sleeves. Details of simulated embroidery stitches. Soft gathering at the color change area on the body. 1” / 2.5 cm of button bands overlap at front. Contrast colors for buttonhole areas. Slightly sloped hem at front.